From 13-17 August 2014, Catherine and Amy presented Closed to the public (protecting space), at the 2014 Melbourne Art Fair, as part of the MAF Edge Program, “Social Capital“, curated by Jacqueline Doughty. Two security guards from the security company contracted by Melbourne Art Fair were employed to prevent people from entering a 2 x 2 metre demarcated area of the Royal Exhibition Building during the fair. Closed to the Public (Protecting space) by Amy Spiers and Catherine Ryan at 2014 Melbourne Art Fair. Photo credit: IMG X Tom Teutenberg. When patrons and visitors to the Art Fair accidentally or deliberately crossed into this space, the security guards instructed them to move away. When patrons asked the guards if they were part of an artwork, the guards replied that they were just doing their job. The space was relocated daily in order to cause further confusion and disruption. Closed to the Public (Protecting space) by Amy Spiers and Catherine Ryan at 2014 Melbourne Art Fair. Photo credit: Amy Spiers. 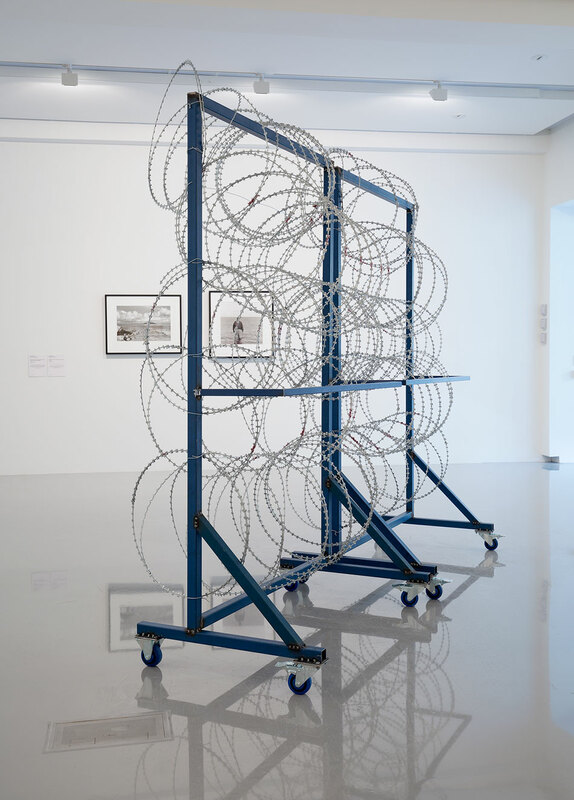 The work aimed to direct attention to the increased regulation and control of the movements of the public, and provoke thought about how this is enforced. A second iteration of Closed to the Public (protecting space) was presented in Freiburg, Germany in February 2016 as part of the Museum für Neue Kunst public program Während der Ausstellung ist das Museum geschlossen/During the exhibition the gallery will be closed. Over four days, a group of 2 to 5 security guards were hired to protect selected areas of public space within Freiburg and prevent the public from entering. The spaces were demarcated with tape and ranged in size from 2 x 2 metres to 4 x 4 metres. When the public crossed over the tape, the security guards firmly told them to desist and move on.